Technique: Sitting on the floor with your feet wider than your hips, nod your head forward and begin to bend forward by hinging at the hips. Breathe normally. As you go down, draw your chin into your neck. “It feels like you’re rolling down the discs of the spine,” says Margot McKinnon, director of Body Harmonics Pilates in Toronto, who trains Pilates teachers across Canada and the U.S. Slide your hands in front of you along the floor. Technique: On your hands and knees, slowly alternate between arching and rounding your back so that all three sections of your spine—lumbar (lower), thoracic (middle) and cervical (upper)—extend together and then flex together. Do this slowly and gently, and don’t force it. One cycle will take three to four seconds. Repeat stretch five or six times. Technique: Lying on your back with knees bent and feet on the floor, stretch your arms out to your sides, palms face down. Think of this as a yoga move and breathe throughout the stretch; inhale and exhale for about four seconds each. Cross your right knee over your left knee, as if you’re sitting in a chair, with your right foot off the floor. Shift your hips to the right about two inches (5 cm), and drop your knees to the left. “You don’t need the knees to touch the floor,” says Marla Ericksen, an integrated fitness coach and spokesperson for CanFitPro. “Come to a natural stop whenever your range of motion is finished.” Your right shoulder will come off the floor a bit, and that’s okay, as long as you continue to face the ceiling. Now, turn your right hand so the palm faces up and reach your right arm back and halfway up toward your head. “That’s to open up the chest and finish off the rotation of the spine,” says Ericksen. Hold for one to three minutes; repeat on the other side. Technique: Sitting on a chair with your feet flat on the floor, twist your upper body so your shoulders rotate to one side. You can use the chair for support, holding on to get a deep muscle stretch. Technique: Stand with your legs wider than shoulder width apart, and turn toes slightly outward. With your abs and buttocks tight, lower your body, bending at the knees, so that your thighs are parallel to the floor. Place your hands on top of your knees. Lift your pelvis (engage the muscles you would use to stop urine flow). Inhale and keep good posture as you press your right hand down on your right knee; exhale and turn your shoulders to your left. Breathe in and out three times (about 20 to 30 seconds total). Stand up, then repeat the stretch on the other side. Technique: Sit on the floor with your knees bent underneath you to your left. With your left hand, hold on to your ankles. Raise your right arm and inhale. 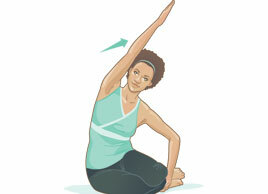 Extend and reach that arm over your head, and exhale as you feel the stretch along the right side of your torso. Hold for 20 to 30 seconds. Repeat twice; switch sides and do three reps. Technique: Lie on your back and bring knees up toward your chest so your body is positioned as if you’re sitting in a chair. Your knees and hips should be bent at 90-degree angles. Now, place the palms of your hands flat on the floor. “Take a deep breath and slowly exhale as you count down from four and bring your knees down to the right side,” says Mark Crocker, owner of In Your Element Personal Fitness and Rehabilitation in St. John’s. Lift your left hip up but keep your shoulders touching the floor. “Always take it slow. If you do it fast, you defeat the purpose of the stretch.” Try to keep your knees together and tip them over as far as you can, while keeping your hands on the floor. Hold for a minimum of 30 seconds. Return to start and repeat, dropping knees to the left this time. Do this stretch daily, once on each side. Technique: Stand against a wall so your tailbone, shoulder blades and head are all pressed against the wall. 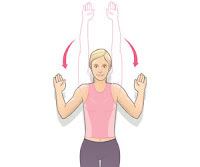 Hold your hands at shoulder level with your elbows bent at 45 degrees, and palms facing forward. Slowly extend your arms up the wall, pointing your hands as far up as they’ll go, not moving your tailbone, shoulder blades or head, and keeping them pressed against the wall. “Be slow and controlled, and try to reach as high as you can,” says Scott Tate, a Toronto-based certified kinesiologist and spokesperson for the Ontario Kinesiology Association. Return to the starting position slowly. You should take about five to 10 seconds to reach up, and another five to 10 seconds to bring your arms back down. Repeat from eight to 12 times (if you have shoulder issues, try three to five times). “It’s surprising how challenging it can be,” he says. You’ll feel the stretch across your chest and shoulders, and up your back. Technique: The key, says Jay Blahnik, world-renowned fitness educator and author of Full-Body Flexibility, is to lengthen the spine rather than forcing the body into a position. Begin by sitting tall, extending both legs in front of you. Bend right knee and cross it over the left thigh, then bend left knee (you can keep your left leg straight if necessary). Take left elbow and place it on the outside of the right knee, then place right hand on the floor behind you, looking over your right shoulder. Hold and breathe deeply for 15 to 30 seconds, and release. Switch sides and repeat. “Try and remember to ‘lift’ through your back and not simply twist your spine,” says Blahnik.